← Dissertation Blog entry #6. Final survey day 6 & Lab session. 2013. Some time in the first week of the foundation year I completed in order to get a place on my degree course (Ecology & Conservation at Manchester Metropolitan University) we all attended a series of talk by lecturers on a variety of programs they managed in addition to their lectures and research. One of these was Jonathan who spoke to us about the Sandwich Year option. If we wanted we could do a work placement for a year in between the second and third years of our degrees. Jonathan showed us some graphs which illustrated that if you did a sandwich year you were more likely to get a job when you graduate and more likely to get a first class degree. 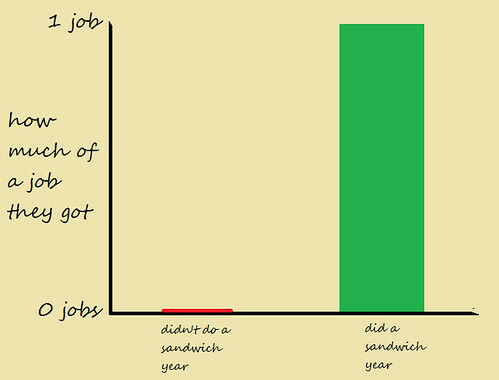 I was interested in both of these things so decided I would make my degree a sandwich degree and do a sandwich year. Over the next couple of years I have to admit I changed my mind repeatedly about whether or not I should do a sandwich year. For a start I am a mature student and all the more keen to graduate and start my new career properly. A placement would add 12 months to my degree and take 12 months off my career. We were also warned that paid ecology placements were few and far between so we should prepare to do a part time placement and work part time along side it. I was working part time along side university in the job I used to do full time and was keen to put behind me. At times it seemed to me there was an emphasis of the experience you would have while on a placement. As in ‘it’ll be a great experience’ rather than ‘you’ll gain great experience’. I thought that might have been more applicable to me when I was a teenager whereas now I was prepared to have a horrible experience if it’d get me a job when I graduated. I still think they are all good reasons not to do a placement and I made the decision that I wouldn’t do one for the sake of it, only if it was one I really wanted. Plus whilst the above is all true, so is the undeniable fact that the opportunity to work for a year in the industry you aspire to work in, gaining skills and experiences that prospective employers will be looking for on CVs, with the kinds of people who may be able to one day offer you at least a reference or advice, and at best a job, is priceless. So I started looking for a placement. I researched ecological consultancies in the North West and a little beyond with the help of Google. To a certain extent you have to try to interpret websites, looking for companies that make a point of including the fact that they offer work placements on their site and contacting them first. A lot of ecological consultancies may in reality only be one person and unable to offer a placement. I sent emails with my CV and received some interest. A couple of places asked to be contacted again later in the year. In truth though I was looking for a back up as I already knew who I wanted to do a placement with. I first heard about Penny Anderson Associates (PAA) through my ecologist friend Richard who as I’ve mentioned in another blog I met through the university’s Mentor Match program. He had suggested if I was going to do a placement with a consultancy they would be an excellent choice and after reading more about them I agreed. I couldn’t contact PAA directly as they offered a regular placement place to MMU so Jonathan would have to send the CVs of any interested parties over to them. There was no getting in there early. My CV was sent over and along with 3 others was invited in for an interview. I knew the other 3 and had that disconcerting feeling of knowing that any one of you has the potential for success. What we had in common was having dedicated our spare time to volunteering and joining wildlife groups. It’s something that is drummed into you from the moment you start uni and yet still most people I study with do no extracurricular activities. Writing my CV for a work placement was the first satisfying CV I’d written. Bat group, plant courses, butterfly courses, volunteering with the Wildlife Trust, it really works. Not only that but once you get into it you forget that it’s benefiting your CV as you find out about more and more. It’s fun, but it’s productive fun. The interview took place at PAAs office in Buxton. I wore a suit. I’d had a crisis of confidence about this the day before wondering if it would be more appropriate to wear a fleece and hiking trousers. No, it’s a job interview of course I should wear a suit. I was very nervous. Something I learned on the day however is that job interviews for jobs you really want are easier than interviews for jobs that your heart isn’t in. It’s easy to think of things to say about a subject you’re passionate about and I came out of the hour long interview confident that I had said most of the things I had wanted to say. I had rehearsed. I’d researched the company at length both in preparation for the interview and just because it’s an interesting company that are involved in all sorts of things I’d like to be involved with. The interview and interviewers were relaxed and friendly which puts you both at ease and on edge simultaneously. Something that became clear as we talked was that the extracurricular activities help you get an interview, but in that interview you need to be able to talk about what you can do. Ticking boxes isn’t enough. I felt I’d held my own but I definitely came away thinking I could have better used some of the time I’d spent doing general conservation volunteering by approaching local ecologists and asking for work experience. It seems obvious now but actually being able to do things is rather than simply knowing what they are is very valuable. After an anxious wait I got an email from Jonathan informing me I’d been successful. Generally I have pretty narrow emotional range. I tend to look and act the same whether something really good or really bad has happened but this was one of the rare special occasions where I was so happy. It was December and my Dad was up visiting from Cardiff. I went to meet him in town, it was pouring with rain and I walked all the way there unable to wipe the smile from my face. That’s my experience of the process of getting a work placement. It may be very different for other people and other placements. Today is Thursday, I start Monday. I’ll be keeping a record on here of my experiences over the next year so if you’re thinking about doing a similar placement yourself or you’re just interested in the day to day of a budding ecologist, stay tuned (I promise future blogs wont be so text heavy! ).